How to shorten your trolling motor shaft. NOTE: The Model 12DD has been upgraded to the Model 1248DD. These Specifications are for historical reference only. The eCanoe 12DD Motor is an adaptation of standard electric trolling motors on the market. Starting with two of these motors, high-impact ABS cowls are added, along with plastic breakaway motor mounts (prototypes are aluminum and plastic). The yoke is hardwood (oak or hickory), and the gunwale clamps are aluminum with stainless steel hardware. The Power Module consists of industrial strength electronics on a High-Current printed circuit board enclosed in a splash-proof cast aluminum case. The Hand Controller is a surface-mounted printed circuit in a sealed plastic case with a waterproof membrane keypad containing the push button controls. Connectors to the Hand Controller and motors are marine grade. The eCanoe 12DD Motor runs off standard, locally available 12 Volt Lead-Acid batteries (and the Nickel Metal Hydride batteries and fuel cells of the future). It draws 50 Amps Max (35 Amps at cruising speed) and will cruise 1 hour or troll 6 hours with a single 60 Amp-Hr battery. 50 to 60 Amp-Hour sealed lead-acid batteries designed for electric wheelchairs and scooters are recommended. These locally available batteries can be tipped over and not spill battery acid – a great safety feature when handling or transporting batteries. Batteries can be charged overnight with commercially available 3-amp two-stage charging modules. These small and lightweight modules can be left attached to the batteries to provide a trickle charge that keeps the batteries ready for the next trip. The batteries can also be recharged faster with automotive battery chargers. Assembly and mounting of the eCanoe 12DD Motor is EASY. All mounting hardware is captive (so it can’t be lost or dropped overboard) and no tools are required. 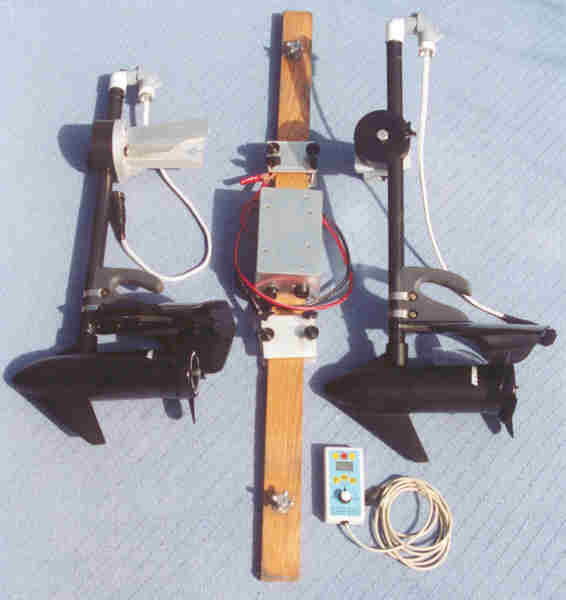 First, the Yoke is clamped to the gunwales, then the Motors are attached and plugged in to the Power Module, and the Hand Controller cable is plugged in. Spring clamps attach to the battery, and the motor is ready to go. 1) Recharge the batteries as soon as possible after use. Keep the top of batteries clean. 2) Store the motor in a dry place. 3) If used in salt water, rinse the motors in fresh water before storing. Special maintenance, such as propeller work and motor cowl adjustment are simplified and require only common hand tools. The modular construction facilitates more extensive repairs. Be sure to keep your boat license up-to-date. In the USA, the boat hull (not the motor) must be registered by your state if used with any motor, no matter what the power source. Check with your appropriate state agency for details. A boat properly registered in one state may operate in any state.